Our 2016 RAISE campaign ended on Sept. 30, 2016. 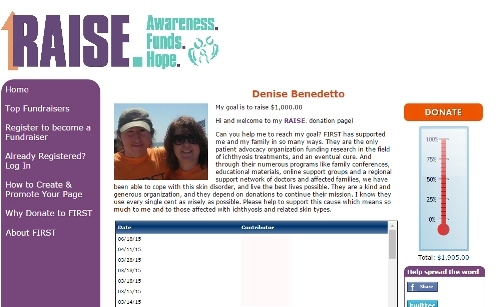 We had 52 fantastic individuals and families sign up to be RAISE partners! Each of them shared their story and asked their friends and families to support FIRST and the ichthyosis community. Over 270 of their friends and family answered by donating $33,549 to FIRST. We cannot thank our RAISE partners and donors enough by joining us in our mission. Your generosity is appreciated by all of us! RAISE. is FIRST’s international online fundraising campaign encouraging people from all across the country to join together and raise awareness, funds, and hope for all those affected with ichthyosis. Plus, it’s so simple to participate. FIRST provides a step-by-step guide on how to create your own personal RAISE. donation weblink (with your photos, your videos, your story). So easy, you’ll be sharing it with family, friends, and friends of friends in just minutes! Here’s what last year’s RAISE. participants have to say! GOAL = $86,000 – The 35th Anniversary celebration continues! Let’s RAISE. 35% more funds than last year! If we collectively raise $86,000 by Sept 31, 2016, we will have met our 2016 RAISE. “FIRST 35th Anniversary Goal” goal, while having a BIG impact on the ichthyosis and related skin type community! Where do all the RAISE. donations go? Donations to the RAISE. campaign will go to FIRST operations, the backbone of the entire foundation. Without operations, there is no website – often the very first point of “relief” for those families affected with ichthyosis. And there is no place to house the vast library of educational materials, many of which our members rely on to care for themselves and their affected children on a daily basis. Without FIRST operations there are no quarterly newsletters, with personal stories from our community and all the latest articles and advice from our ichthyosis medical experts. There are no regional opportunities to connect. Without FIRST operations, there are no national conferences and no life-changing moments for all who attend. 30 more families will be able to attend the 2016 National Conference in June, some meeting others with ichthyosis for the very first time. 12 new patient support conference calls have been scheduled, ranging from guidance for grandparents of those affected, to understanding occupational therapy, to how to navigate your way through health insurance. 4 patient support meetings were held where nearly 150 members across the country could speak with medical experts, make new friends, and find new information regarding caring for their condition. $50 covers the cost of printing of specialized awareness cards, making life a little easier for those living with these visible, rare skin diseases. $75 covers the cost of holding one FIRST to Know call, making life changing connections for our members. $100 covers the cost of a family to attend a Patient Support Forum, which allows more families to attend thanks to reduced registration fees. Don’t wait, create your RAISE. page today! RAISE. campaign begins at 12 AM June 13, 2016 and ends at midnight September 30, 2016. Happy Raising! Cannot participate, but want to support the RAISE. campaign? Make a donation here.